Did you know that you can sponsor a fish on its quest up Rock Creek and even name it AND win a prize if your fish is the fastest or swims the most miles? Well, it’s true. Rob Roberts, of Missoula, has a FUNDLY page and is accepting sponsors right now. As a matter of fact, as of the afternoon of March 29th, he had raised $2,185. Every spring, cutthroat trout congregate in healthy tributaries of the Clark Fork River to begin their long journey up the stream to spawn – with some fish known to swim more than 100 miles in several weeks. 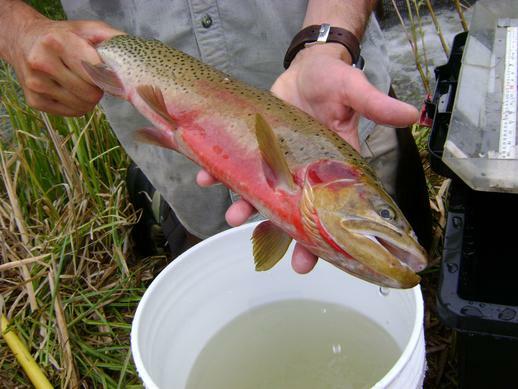 By sponsoring one of these fish, you can help Montana Fish, Wildlife and Parks and Trout Unlimited with the scientific research to tag, track and identify barriers during the fish’s quest to reproduce. Watch for weekly updates to the online map and leaderboard to see which fish moves the fastest and which fish swims the most overrall miles throughout the summer. There are several different incentives for different giving levels, as $25.00 (Trout Fry) will give you a partial sponsorship of one cutthroat and is applied toward the support of Trout Unlimited and MT FWP in their restoration work in the Rock Creek drainage, while $500 (The Big One that Got Away) gives you a sponsorship of one cutthroat trout, and you can pick their name (ie. your name or company/organization) for use on the online map. Your donation also supports the restoration work of Trout Unlimited and MT FWP in the Rock Creek watershed, and you get a personal tour of the project area. If you’re interested in this project or donating, check out Roberts’ FUNDLY page by clicking here. There is also contact info for him there, too. Holter Lake Trout are Biting!